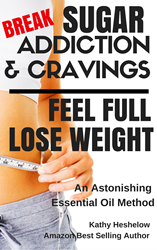 The Book is Entitled "Break Sugar Cravings or Addiction, Feel Full, Lose Weight: An Astonishing Essential Oil Method". Start 2018 in a Healthy Way, and Get a Special Half-Off Discount on Natural Tools. Understand what you need to know about sugar, sugar consumption and how to reduce it for a healthier life. "Many struggle to get on a healthier path," says author Kathy Heshelow, "and don't realize that sugar is addictive and can undermine efforts. Sugar is actually hidden in many foods." Shocking facts and surprising health issues are presented in the book "Break Sugar Cravings or Addiction, Feel Full, Lose Weight: An Astonishing Essential Oil Method", available now. One important fact that many do not understand is that sugar reacts with and induces a response in the same part of the brain as cocaine and nicotine, and is behind why cravings occur. Another important fact is that sugar consumption has increased dramatically in recent decades, mirroring the rise in many associated diseases, discussed in the book. Americans consume in 2 weeks the amount that ancestors consumed in an entire year. In fact, through the mid-nineteenth century, diabetes was a rare disease. The book lays out a number of facts and referenced resources; gives a specific natural-based action plan, and offers some lifestyle tips and helpful aids. "My goal is writing this short book was to help myriads of people who are overweight, addicted to sugar and need an avenue of assistance or path. Information is power," says Heshelow. "And what better time to start than in the new year." ABOUT: Heshelow has written a number of books in two main subjects, with the most numerous about wellness. She is currently working on 2 new books for 2018. Heshelow founded Sublime Naturals, a store for wellness featuring essential oils and natural products and hosts a podcast called "Essential Oil Zen", with new episodes appearing soon.